The Aluto Langano Geothermal Pilot Plant (ALGPP) is located on the Aluto volcanic complex of the Ethiopian Rift valley, close to the eastern escarpment between Lake Langano and Lake Ziway, some 200 km southeast of Addis Ababa. The Aluto volcanic complex is a young acidic system consisting of domes, lava, and pyroclastic interbeds. The geothermal field was explored using geological, geophysical and geochemical survey methods prior to geothermal exploration drilling during the period 1981 to 1985. The initial feasibility study was conducted in 1986, which concluded that the geothermal resource was sufficient to support power generation. Construction of the ALGPP began on January 1,1997. Ormat supplied and installed two units: the Geothermal Combined Cycle Unit (GCCU) and the Ormat Energy Converter (OEC), each rated at about 4 MW gross. The GCCU is composed of a conventional steam turbine and an organic turbine, each driving opposing ends of a single generator. 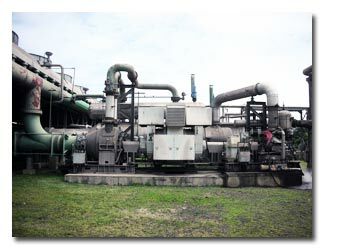 High-pressure geothermal steam from two wells enters the steam turbine first and then passes to a shell-and-tube heat exchanger where the steam is condensed and a binary fluid is vaporized to drive the organic turbine. The OEC unit is driven by a binary fluid which is heated and vaporized in a shell-and-tube heat exchanger. The heat exchanger uses medium pressure geothermal steam from two wells and brine from all four productive wells. The power plant was handed over to the Ethiopian Electric Power Corporation (EEPCo) on June 30, 1998. The OEC was in operation for barely 18 months, from July 1998, to December 1999, before shutting down when leaks developed in the heat exchanger tubes. The GCCU was in operation from July 1998 to June 2002, when it had to be shut down due to failure of the steam turbine bearings. 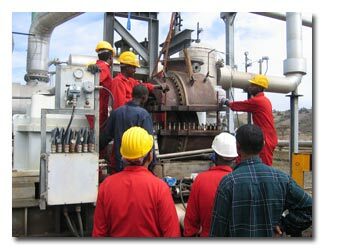 Geothermal Development Associates (GDA), under contract to Ethiopian Electric Power Corporation (EEPCo), began work on the site in early 2006. The rehabilitation effort has involved extensive assessment, repair and testing of both the plant and wellfield. In addition, GDA provided training for EEPCo personnel in the U.S. and Africa. After extensive repairs and upgrades, GDA and EEPCo successfully re-commissioned the GCCU in June 2007. Repairs included de-staging the steam turbine, replacement of steam turbine bearings and steam seals, complete overhaul of air-cooled condenser fans, drive components (motor bearings, shaft bearings, belts and pulleys) and upgrades to the plant and unit PLC-based control systems. The Aluto Langano plant is the first and only geothermal power plant in Ethiopia and the only operating geothermal power plant in Africa outside of Kenya.